Earlier this year, I randomly came across a Facebook post which said that some bloke called Joel Grind was giving away his first solo album for free download on his bandcamp page. Looking at the name and artwork of the album (he called it 'The Yellowgoat Sessions'), I naturally was intrigued. Little did I know that I was about to discover a musician whose genius cannot be contained in a few words. This guy has been as active as quicksilver, with his numerous side projects aside from his main project i.e. Toxic Holocaust. What is fascinating about this, is each and every project of his, has a unique sound and no two projects sound the same! Coming back to his main project, Toxic Holocaust had been silent for almost a year, before announcements came that a new album was in the works and immediately this album shot up to the top of the ‘Albums I look forward to list’. After some impatient waiting, it is finally here. Now there are a few things I expect before diving into an album by a band like Toxic Holocaust: Speed, variety, darkness and overall enjoyment. 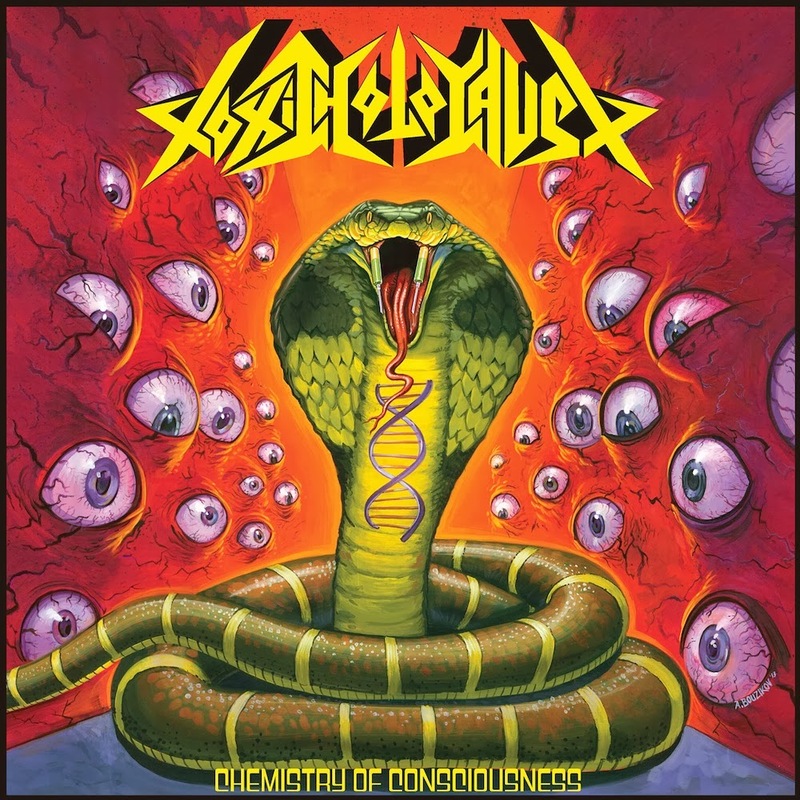 Toxic Holocaust’s fifth full length, titled ‘Chemistry Of Consciousness’ delivers all this and more. This album is being released through Relapse Records and will drop on 29th October, 2013. The album delivers a rough sounding flavour of Black Thrash Metal, infused with some punk urgency. The riffs that accelerate to breakneck speeds and the dark and grim atmosphere is sure to leave any person who likes black or thrash metal, with a broken neck. Starting off with the track ‘Awaken The Serpent’ the listener is treated to riff after riff of blackened thrash that have been expertly crafted at the hands of the genius who goes by the name of Joel Grind. The songs are short and every track hits bulls eye, owing to the flawless execution. There is no dearth for evil here in the music. And the voice of Joel Grind adds that much more darkness to the lyrics he spews out. The drummer Nikki Rage works hard to churn out some powerful and fast beats infused with some great fills. The punk elements are ever present and they add a fast and hard edge to the tunes. Bass work of Philthy Gnaast is heavy but not very prominent that it makes a great impact. The production is dirty and griminess of it makes it all the more appreciable. I couldn't for the sake of me, imagine an album such as this, had it been done with a crystal clear production. The guitar solos are rare on this record, but when they do rear their ugly heads, they make sure to leave an impression. With a playtime of only half an hour, this is a very short record. But that is alright, because by the time the record ends, the listener would need some serious nursing for his / her neck. It’s a weird coincidence that on the same date two albums of almost similar styles of music are releasing albums that sport serpents on the cover. I am talking about the new Skeletonwitch album of course and comparison is going to be inevitable. Now ‘Serpents Unleashed’ was a great album. Nonetheless, I am going to have to give the edge to ‘Chemistry of Consciousness’ for the sole reason that it is not only dirtier but also a tad bit more evil sounding. It has not even been more than a year since I discovered Joel Grind, but I have no doubt in my mind that this guy is a genius. 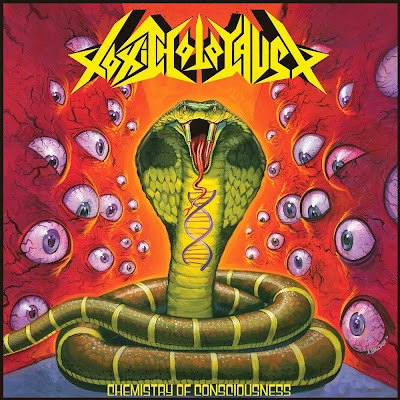 With ‘Chemistry of Consciousness’, Toxic Holocaust have added another deadly album to their already lethal discography.